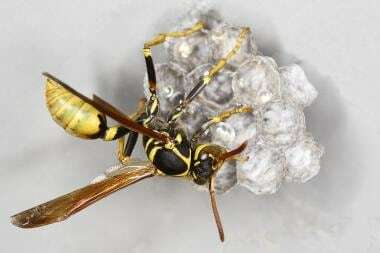 Hymenoptera stings account for more deaths in the United States than any other envenomation. The order Hymenoptera includes Apis species, ie, bees (European, African), vespids (wasps, yellow jackets, hornets), and ants (see the images below). Most deaths result from immediate hypersensitivity reactions and anaphylaxis. Severe anaphylactoid reactions occur occasionally when toxins directly stimulate mast cells. In addition to immunologic mechanisms, some injury occurs from direct toxicity. While the vast majority of stings cause only minor problems, stings cause a significant number of deaths. Fire ants. US Department of Agriculture. Courtesy of Wikimedia Commons. See Arthropod Envenomation: From Benign Bites to Serious Stings, a Critical Images slideshow, for help identifying and treating various envenomations. See also All About Allergies: Be Ready for Spring, to help identify a variety of allergens and symptoms. Target organs are the skin, vascular system, and respiratory system. Pathology is similar to other immunoglobulin E (IgE)–mediated allergic reactions. Anaphylaxis is a common and life-threatening consequence of Hymenoptera stings and is typically a result of sudden systemic release of mast cells and basophil mediators. Urticaria, vasodilation, bronchospasm, laryngospasm, and angioedema are prominent symptoms of the reaction. Respiratory arrest may result in refractory cases. Hymenoptera are social creatures that typically sting to protect their colony, nest, or hive. Most stings are incited by proximity to the colony. Noisy or vigorous activity (eg, lawn mowers, weed eaters), bright or dark colors, and perfumes also may incite stings. When a colony is disturbed, many Hymenoptera release defense pheromones that attract other members of the colony to sting. These pheromones are released during stinging or when an insect is smashed. 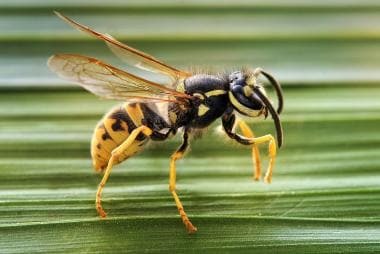 Although bee and wasp venom varies from species to species, all venom is composed primarily of proteins, peptides, and amines. Toxic components include phospholipase, histamine, bradykinin, acetylcholine, dopamine, and serotonin. In addition, mast cell degranulating (MCD) peptide and mastoparan are peptides that can cause degranulation of mast cells and result in an anaphylactoid reaction. Molecule size and the presence of protein enhance the antigen properties of venom, making it a potent activator of the immune system. Most significant reactions are mediated through true IgE allergic mechanisms that activate mast cell degranulation. Anaphylactoid reactions may occur. However, venom load may be sufficient to cause fatal injury without the added effects of the endogenous system. This may result from as few as 30 vespid stings or 200 honeybee stings. Since the compounds are similar in anaphylactic and toxic reactions, pathology and treatment also are similar. Bees and wasps sting through a modified ovipositor. They puncture the skin with a hollow stinger and then inject venom. Bees leave their barbed stinger in the skin along with its stinging apparatus, killing the bee. Vespids have smooth or less-barbed stingers and can sting more than once. Vespids are responsible for almost twice as many allergic reactions as honeybees. Retained stingers can cause granuloma formation and subsequent epidermal necrosis. "Killer" bee is the moniker applied to the Africanized honeybee (Apis mellifera scutellata), which was originally introduced into the New World as a hybrid of European honeybees and a variety of honeybee from Africa. Toxicity from the sting of a single Africanized bee is no worse than the sting of a single European bee. Africanized honeybees show behavioral changes, including increased defensive stinging. One pheromone, isoamylacetate, has been isolated as a mediator of aggressive group-defensive behaviors in Africanized bees. Africanized bees defend their hive up to a 150-yard radius, three times the distance of European bees. As of May 2000, Africanized bees have migrated from their western-hemisphere origin in Brazil to Texas, Arizona, California, New Mexico, Nevada, Utah, Alabama, Louisiana, Arkansas, Oklahoma, and Florida, according to the US Department of Agriculture. Multiple stings from these species are more common. Honeybees fly at only 4 mph, allowing most victims to flee after only a few stings. Overwhelming numbers of stings usually occur in young patients or in those slowed by physical limitations or intoxication. In addition to reaction to stings, bee venom may be encountered as a result of apiotherapy, a modality used in traditional Chinese medicine. In this treatment, ointment containing bee venom is applied to skin or eye and may result in an immunologic reaction. Ants account for one half of all insects. While many ant species sting, the most aggressive in the United States are imported fire ants, Solenopsis invicta. These ants fiercely guard their territory and attack intruders in large numbers, inflicting thousands of stings and bites to victims unable to escape. Fire ant venom is 95% alkaloid, which is unique among ants. A fire ant typically bites with its mandibles, then swivels its abdomen and stings repeatedly in an arc about the bite site. Their stings develop into sterile pustules and then rupture, leaving crusted wounds that may become infected secondarily. 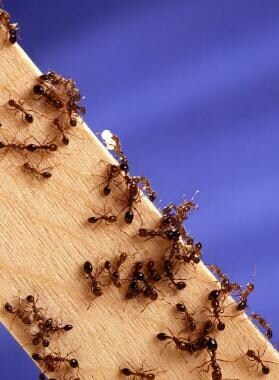 Patients have survived as many as 5000 fire ant stings. Brazilian fire ants, S invicta, have nearly eradicated native ant species in their range from Florida to Texas and north to Arkansas and South Carolina. S invicta is found in South and North America in areas where mean high temperatures are 15°C or higher. Stings from other ants often closely resemble those of wasps and bees, although with less tissue destruction and less severity. Harvester ants, Pogonomyrmex species, inject venom containing a hemolysin. This sting frequently creates an ecchymotic area surrounding the sting site. Some species of field ants truly bite with the mandible and spray the acidic toxin into the wound without injecting venom. Formic acid, a component of ant venom uncommon in bee or wasp stings, is derived from the superfamily name Formicidae. Ant stings cause generalized reactions less often than stings from flying Hymenoptera. Hymenoptera stings of all types are more common in males than in females, probably because of more frequent exposure. Although most deaths from toxic reactions occur at extremes of age, frequency of bites is not age dependent. Peak incidence of death from anaphylaxis is in people aged 35-45 years. Most stings resolve with no residual complaints. Large local reactions do not predispose patients to generalized reactions in the future. Less severe generalized reactions precede most fatal reactions. Wasps and bees cause 30-120 deaths yearly in the United States. Educate all patients on how to avoid stings. For patient education resources, see the Bee and Wasp Stings Center, Environmental Exposures and Injuries Center, Allergy Center, and Allergic Reaction and Anaphylactic Shock Center, as well as Bee and Wasp Stings and Severe Allergic Reaction (Anaphylactic Shock). For related information, see Medscape's Allergy Resource Center. [Guideline] The diagnosis and management of anaphylaxis: an updated practice parameter. J Allergy Clin Immunol. 2005 Mar. 115(3 Suppl 2):S483-523. [Medline]. Tarpy D. Africanized Honey Bees: Where Are They Now, and When Will They Arrive in North Carolina. NC State Cooperative Extension. Available at http://content.ces.ncsu.edu/africanized-honey-bees-where-are-they-now-and-when-will-they-arrive-in-north-carolina/. February 5, 2015; Accessed: September 23, 2015. Galera C, Soohun N, Zankar N, Caimmi S, Gallen C, Demoly P. Severe anaphylaxis to bee venom immunotherapy: efficacy of pretreatment and concurrent treatment with omalizumab. J Investig Allergol Clin Immunol. 2009. 19(3):225-9. [Medline]. Hernandez M, Gonzalez S, Galindo G, Iaz A, Rodriguez P. University Hospital, et al. Reactions to hymenoptera sting in adult patients: experience in a clinical allergy/immunology service in Monterrey Mexico. World Allergy Organization Journal. 2007/11. S216-S217. Pegula S, Kato A. Fatal injuries and nonfatal occupational injuries and illnesses involving insects, arachnids, and mites. Workplace Injuries. Aug 2014. 3(17):[Full Text]. Prado M, Quirós D, Lomonte B. Mortality due to Hymenoptera stings in Costa Rica, 1985-2006. Rev Panam Salud Publica. 2009 May. 25(5):389-93. [Medline]. McGain F, Harrison J, Winkel KD. Wasp sting mortality in Australia. Med J Aust. 2000 Aug 21. 173(4):198-200. [Medline]. Langley RL. Animal-related fatalities in the United States-an update. Wilderness Environ Med. 2005. 16(2):67-74. [Medline]. Rhoades RB, Stafford CT, James FK Jr. Survey of fatal anaphylactic reactions to imported fire ant stings. Report of the Fire Ant Subcommittee of the American Academy of Allergy and Immunology. J Allergy Clin Immunol. 1989 Aug. 84(2):159-62. [Medline]. Valkanas MA, Bowman S, Dailey MW. Electrocardiographic myocardial infarction without structural lesion in the setting of acute hymenoptera envenomation. Am J Emerg Med. 2007 Nov. 25(9):1082.e5-8. [Medline]. Betten DP, Richardson WH, Tong TC. Massive honey bee envenomation-induced rhabdomyolysis in an adolescent. Pediatrics. 2006 Jan. 117(1):231-5. [Medline]. Reisman RE. Unusual reactions to insect stings. Curr Opin Allergy Clin Immunol. 2005 Aug. 5 (4):355-8. [Medline]. Vachvanichsanong P, Dissaneewate P. Acute renal failure following wasp sting in children. Eur J Pediatr. 2009 Jan 16. [Medline]. Visscher PK, Vetter RS, Camazine S. Removing bee stings. Lancet. 1996 Aug 3. 348(9023):301-2. [Medline]. Alqurashi W, Stiell I, Chan K, Neto G, Alsadoon A, Wells G. Epidemiology and clinical predictors of biphasic reactions in children with anaphylaxis. Ann Allergy Asthma Immunol. 2015 Sep. 115 (3):217-223.e2. [Medline]. De Soto H, Turk P. Cimetidine in anaphylactic shock refractory to standard therapy. Anesth Analg. 1989 Aug. 69(2):264-5. [Medline]. [Guideline] Sturm GJ, Varga EM, Roberts G, et al. EAACI guidelines on allergen immunotherapy: Hymenoptera venom allergy. Allergy. 2018 Apr. 73 (4):744-764. [Medline]. Fire ant bites. In less than 10 seconds, an unwary scientist was stung over 250 times on one leg when he carelessly knelt on a collapsed fire ant mound. The sterile pustules developed to this stage in 3 days. US Department of Agriculture. Courtesy of Wikimedia Commons.